few as two fabrics, or a multiple of prints for a very different look. to give it a contemporary flair. background or let soft coloured leaves pool on a gentle background. 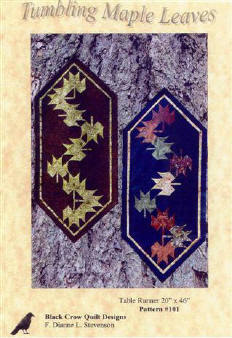 The leaves may be all the same, each different or multiple fabrics can be used in each one. Go wild playing in the leaf pile! Make tracks with this contemporary rendition of traditional “Bear’s Paw” design. Have fun choosing a feature fabric to change the feeling of the whole project. Marry Aboriginal symbolism with the familiar pattern for a rich West Coast accent. Substitute fun fabrics for classic and make a piece to warm the heart of the outdoorsman. Keep in mind that the feature fabric is placed horizontally and vertically to highlight your piecework. November 11, our visible gratitude to those who have fought and are fighting for our freedom gets put in a drawer along with the flower. In designing “In Honour Of…” I wanted to make a tactile piece that records the pride in our forces and recognize those who have touched my life. As Canadians we are often regarded as quiet and undemonstrative, I think that this piece shreds that stereo type and will let us show the pride and passion that makes us fiercely loyal. 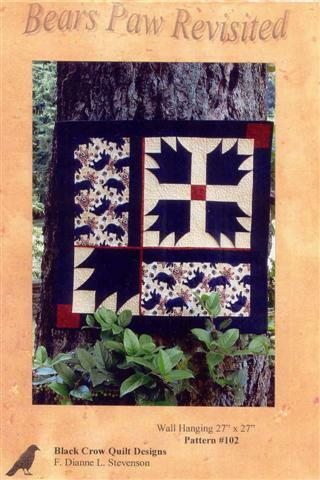 Possible sizes: 36 1/2" Sq. or 52 1/2" Sq. July 1st. 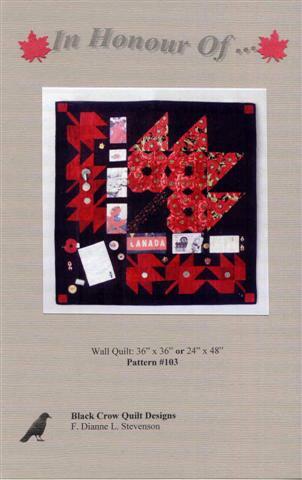 celebrates the signing of the British North American Act which established the independant Dominion of Canada in 1867. We are a country of vast expanses, a wonder of cultures an often understated current of patriotism. Officially "Dominion Day" was changed to "Canada Day" on July 9, 1982 but there is no denying our roots, our growth and our pride what ever you may call it.